For nearly two decades, the Iowa Sports Turf Managers Association has annually administered a SilentAuction during trade show hours at the Iowa Turfgrass Conference and Trade Show. Since the program's inception in 2001, it has raised nearly $70,000 for Iowa students interested in pursuing a career in the sports turf industry. At the 2018 Silent Auction, a record $13,760 was raised! The Iowa Sports Turf Managers Association is once again seeking donations for its Silent Auction. Showcase your company and products while supporting a good cause. In previous years, donated goods ranged from apparel, tools, irrigation components, and agricultural products. Participating in the Silent Auction is a great way to gain additional exposure before, during and after the Iowa Turfgrass Conference and Trade Show. To participate, download and complete the donation form and return to the Iowa Turfgrass Office, by emailing to shawn@iowaturfgrass.org. 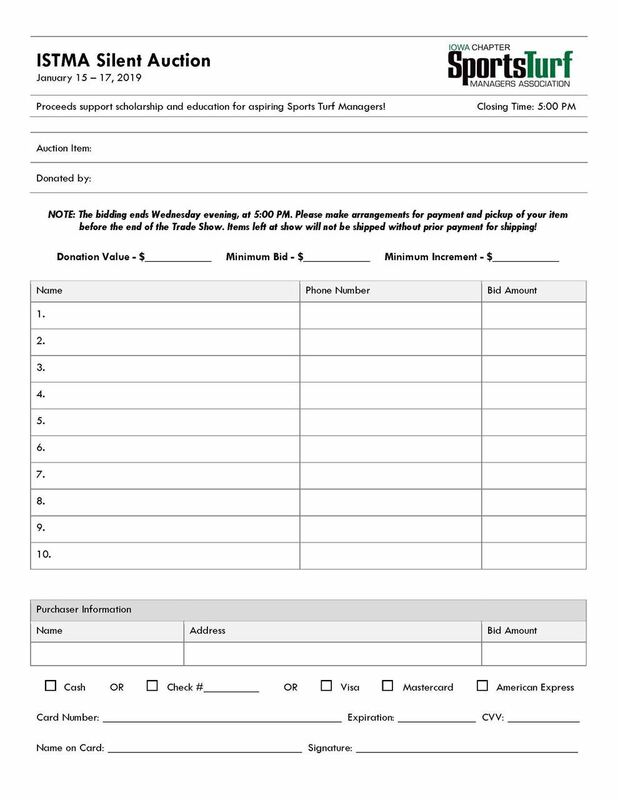 Return the donation form prior to January 1, 2019, to receive exposure for your donation leading up to the Iowa Turfgrass Conference and Trade Show.